One of the pesky problems of virtual reality is that, for the most part, your hands are MIA. Yes, there are controllers - or virtual wands, if you will - but these involve waving the controller around and seeing a digital hand perform actions your real-life hand isn't doing. The physics involved in making it feel like you're interacting with a virtual object, let alone multiple ones, is difficult, and not something most VR manufacturers are even close to achieving right now. Yet solutions are in the works, such as these gloves, and now a collaboration between Microsoft Research, the University of Southern California and the University of Waterloo has cooked up another, potentially groundbreaking paw problem solver of its own. 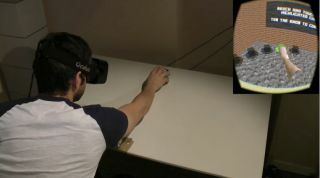 The team's research found that by manipulating (or, as they say, hacking) human perception, they could get subjects to have a greater sense of presence in VR with their hands. They just needed one prop - in this case, a cube for Minecraft - and their so-called haptic retargeting techniques to trick users into thinking they were actually working with multiple blocks in the virtual realm. The first technique involves messing with body perception. It starts with the user seeing three cubes on a table, then removing two of the cubes once they put on the headset. Three virtual cubes are present in the VR realm, however, so the user thinks they match the cubes they just saw on the table. While this is going on, the researchers adjust users' body space in the VR experience to "provide the illusion that you are reaching for a different cube each time." So, you feel like you are orienting towards the different virtual blocks, yet you're really just reaching towards the same, unmoving block. Next, the researchers used a world warping technique. Subjects moved their head in the real world to highlight the next virtual block they're supposed to touch. The head movement caused the virtual world to rotate, and the physical cube - which hasn't moved - is aligned with the highlighted virtual cube. Finally, the researchers used a hybrid warping approach that combined world-warping head motions with body-warping hand motions. Research subjects were tricked into thinking they were moving multiple cubes, and could even be led to believe they were stacking cubes, when they were really just moving the same ol' cube. It was in using the two techniques combined that subjects reported the greatest sense of presence, also saying they preferred it over virtual wands. The process involves several components that might be difficult to set up at home by yourself, including another person to move those two expendable blocks out of the way, but perhaps it could be refined into a solution that's shipped with hardware down the line. This is an early research test, but perhaps Microsoft could incorporate its findings into a solution for HoloLens or other VR viewer, lending a hand to the likes of Oculus Rift. I'll see myself out now.